How should we communicate information—when we sell? When we teach? How do we get better at it? And how do we share what we know with others? Killerpresentations.com is my attempt to explore these things. 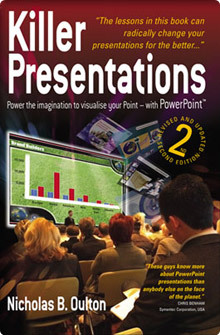 I launched m62, a presentation development company 18 years ago and have since spent much of my time travelling the world, working with presenters and developing a methodology for face-to-face communications using PowerPoint. I present most days, I have written over 5000 business-to-business presentations (75% pitch or sales presentations) for others and critiqued probably the same. In short I have more experience as a presenter than I do as an audience member. I’m not bad at it but like all of us the harder I work at it; the better I get. I began coaching maths students in University as a side job, and began teaching presentation skills as part of my responsibilities at the campus radio station. I graduated and worked in Asia as a business trainer and presentation coach, teaching decision-making and problem solving (practical, applied philosophy). Now, my role at m62 sees me coaching bid teams and a lot of CEO coaching. I have always had business schemes growing up, from running the sweet shop at school (ate the profits), to TV rentals or car service for the campus drunks. Nothing prepared me for the leap of faith that was m62 13 years ago but I promise you the old adage that the most important thing in business is cash flow, is a lesson well learnt. Three I’m laying claim on: Matthew (10), Edward (8), Rachael (5 going on 20). I’ve been married for 12 years and counting, don’t know what she sees in me except I can cook and I generally do what I’m told. Dedicated Killer Presentations to her, the dedication in the front is still true.